Please report any issues you have in the comments below the article introducing this dictionary. 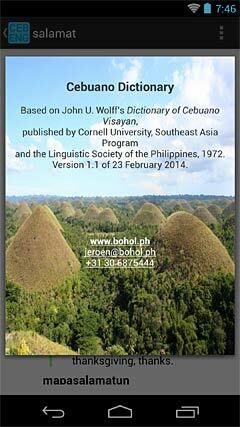 This web page can be used to look-up entries in John U. Wolff's Cebuano-English Dictionary. You can search this dictionary in various ways. By Cebuano words. Here all entries containing the Cebuano word will be returned. Note that for common words, such as "ang", almost all entries will be returned. By English words. Here all entries containing the English word will be returned. Note that for common words, suchs as "to", almost all entries will be returned. 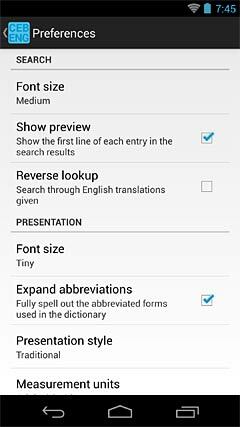 If you check "head words", the search will be restricted to headwords in Cebuano, and direct translations only. If you check "exact match", the search word needs to match exactly. Otherwise, accents will be ignored, and, in Cebuano, the letters o and e will be mapped to u and i, to match Wolff's orthography for Cebuano. If you check "structural view", the entries will be shown in a more expanded way, to indicate the structure of the entry. This structure is automatically derived from the typographical features of the entry, so may not always be correct. In all search modes, you can use wildcards. Use a star to represent a range of letters you don't know, for example, type sea* to find all words starting with sea. Type l?? ?p to find all five letter words starting with an l and ending with a p.
Cross references in the dictionary are hyperlinks, and can be used to quickly go to the head word referenced to. Scientific names of plants and animals are rendered as links to a Google search, so you can quickly find more information about them. If you log in to your Bohol.ph account, you can also add notes to entries. These can be made public if you so desire (but note that the site administrator can see all such notes, also those not made public). Please mention issues you find within an entry in a note, so they can be fixed. Returned entries will have a link to the page image it appears on, hosted at Cornell University SEAP. 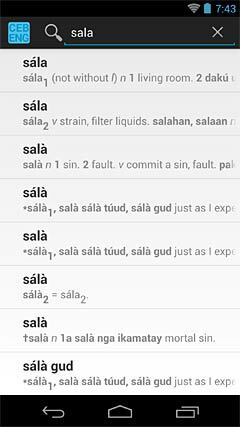 This dictionary is now also available as an Android App for off-line use. This means that you can access the dictionary also when you are not on-line. You can download the app (for free) from Google Play (5 MB download, requires 21 MB on your device). For those technically inclined, the source code for this app is available via BitBucket. If you encounter bugs, please report them here (or just use the feedback options of this site). 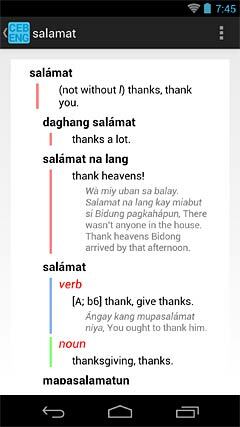 This Cebuano-English dictionary is now also available as a stand-alone Android app, which means you can access it even when off-line. You can download the app from Google Play (5 MB download, requires 21 MB on your device). Wolff's Cebuano-English Dictionary is one of the best dictionaries ever written for the Cebuano language, which is spoken on the islands of Cebu, Bohol, Siquijor, the province of Negros Oriental, and much of Mindanao. This dictionary of over 1200 pages was first published in 1972. To lookup a word in Cebuano, simply type it into the search box. If you are not sure about the spelling of the word, you can use a question mark (?) for a single unknown letter, or a star (*) for a sequence of letters. If you cannot find a word at first, try using stars before or after it. Please do no try to harvest all words in this dictionary with a robot. You will waste bandwidth, and won't get you the best available data. If you need the entire dictionary in one file, please ask the webmaster. The author, John U. Wolff, and his publisher have given permission to reproduce this dictionary on this site, for which many thanks. A PDF version formatted for A4 format printing is available here (9 megabyte download). Daghan Salamat to the Distributed Proofreaders team and Scott Robertson for their help in digitizing this dictionary.